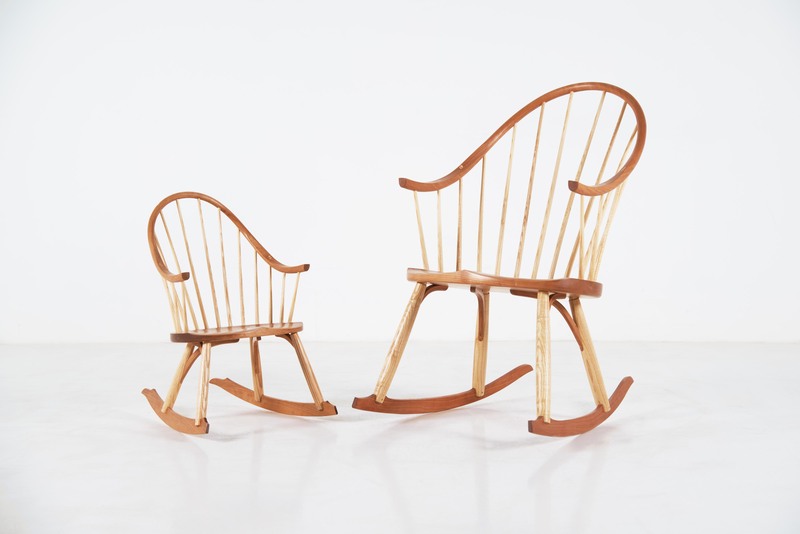 Apart from its diminutive size, the Child’s Continuous Arm Rocker is identical to its full-sized sibling. Our commitment to heirloom quality always applies – regardless of the customer’s age. 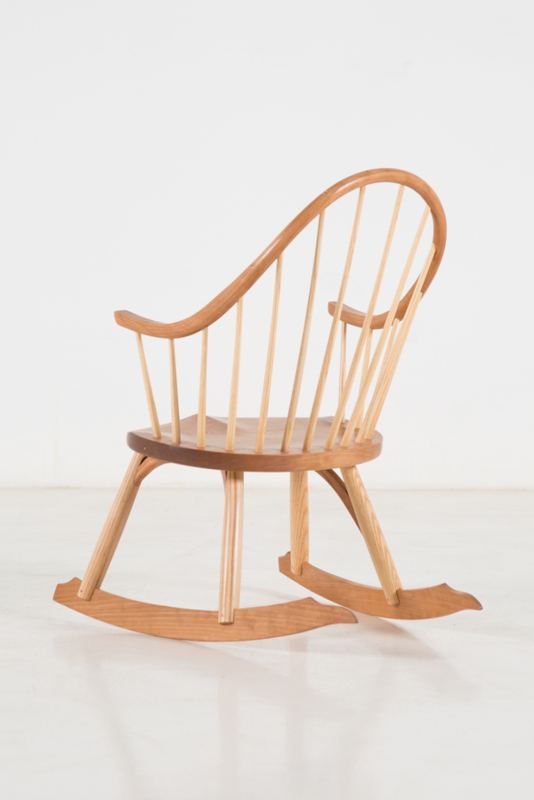 Adapted from our full-sized Continuous Arm Chair, this younger iteration – in rocker form – is designed and crafted to last, bringing joy and satisfaction to both small rocking connoisseurs and their parents. 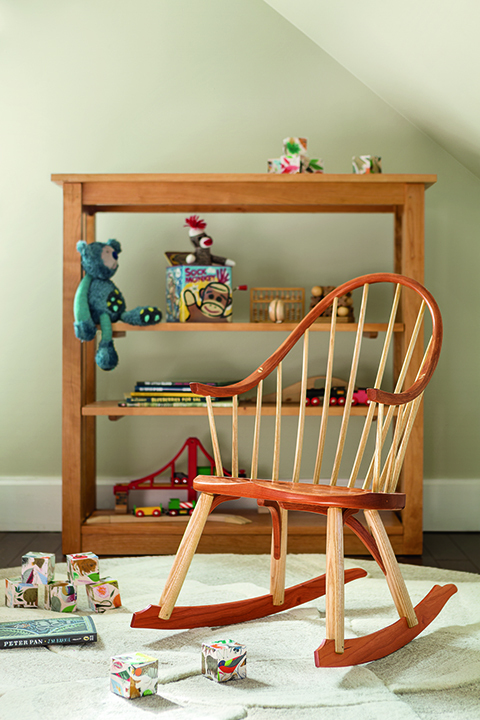 Altered from our original Continuous Arm Chair, the Child’s Continuous Arm Rocker features a lower seat height, moving the center of gravity toward the back for easier rocking. The rockers, crafted in sustainably harvested North American hardwood, allow the perfect amount of roll while providing ample stability. 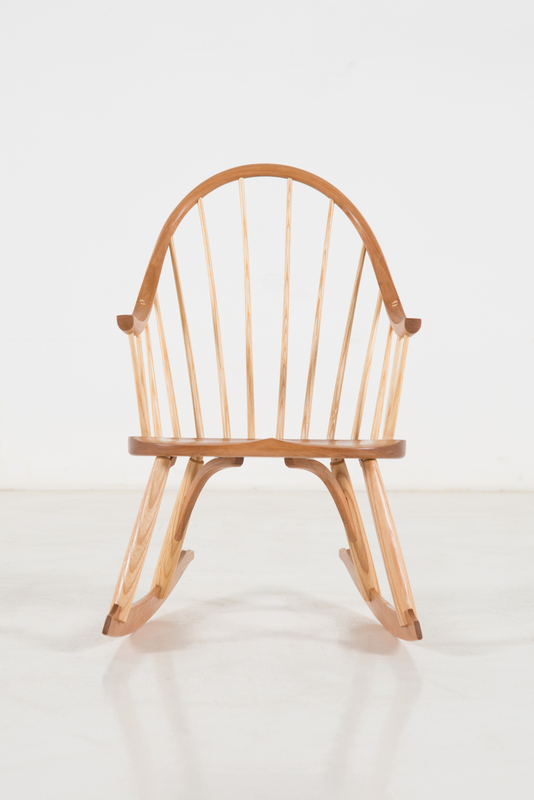 The rocker’s namesake arm is created using flitch-cut cherry or walnut. The process involves quartering and steaming sections of logs, then slicing them into tenth-inch thick strips. The knife cuts produce no sawdust – and thus no waste – and the board’s full strength is preserved. 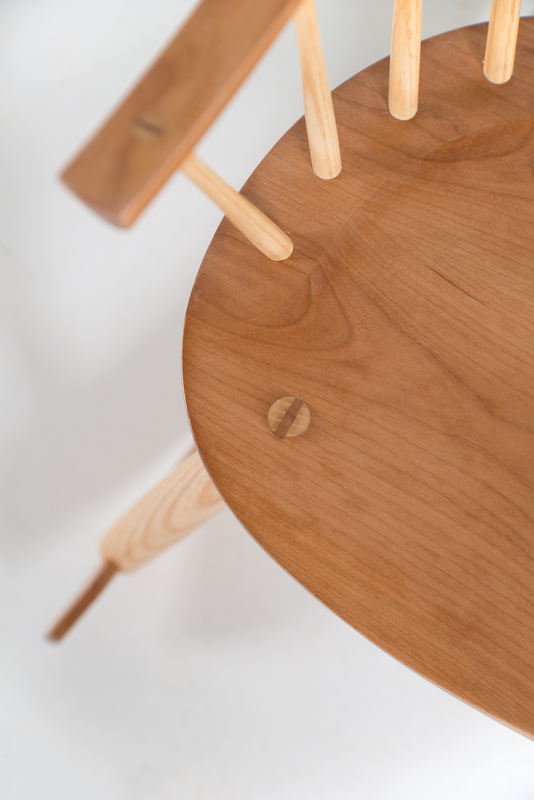 When the pieces are shaped and glued back together, the arm is comprised of eleven different layers, while retaining the strength and appearance of a solid wood. 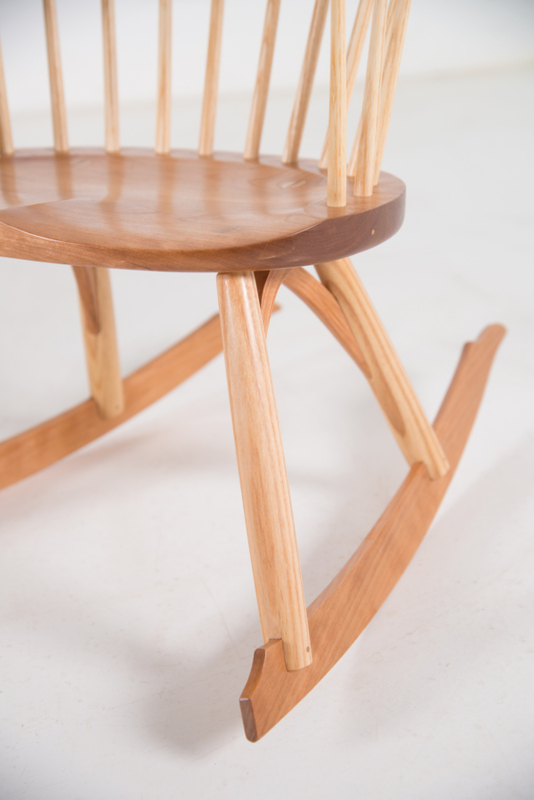 The Child’s Continuous Arm Rocker also includes other refinements, such as a highlight (raised section) that runs around the back of the chair, where the spindles join the seat. 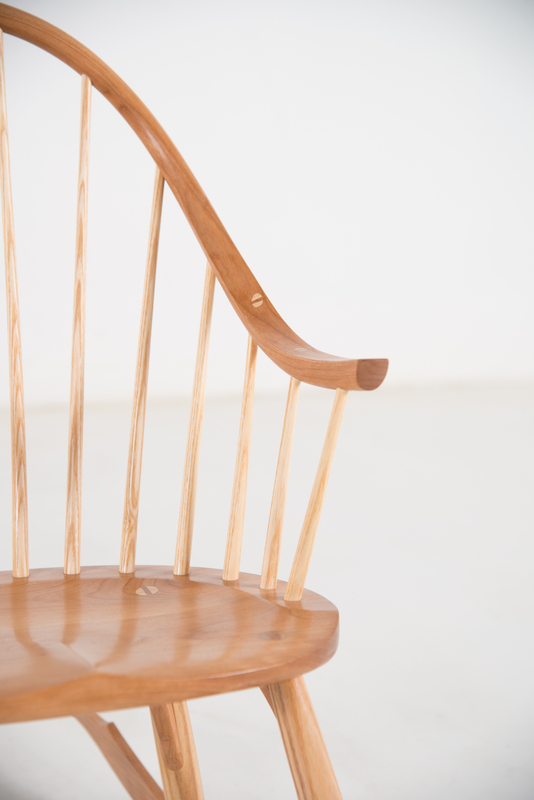 The spindles extend all the way through the seat and are wedged top and bottom, making them not only aesthetically pleasing but easy to repair should the need ever arise. The spindles are so finely tuned, you can pluck them the way you would with a string on a harp and they should resonate at the same frequency. 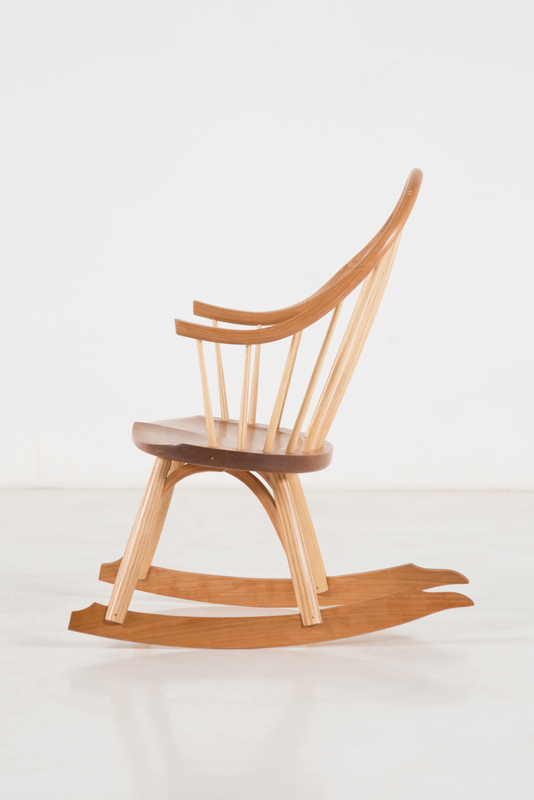 The legs represent the rocker’s final distinction. Most Windsor chairs have stretchers that connect the legs to one another. Over time, stretchers get creaky, gather dust and interfere with feet seeking space for a more comfortable position. Recognizing another opportunity, we have replaced the stretchers with a curved brace called a ship’s knee. Supportive and strong, the ship’s knee is created from 1/32″ laminated ash that is bent to shape, and then set into a slot that is cut and shaped into the leg, so it is flush with the surface.